Apple’s first smartwatch is finally here and available to the public. If you’re one of the few lucky ones who ordered the device in the first 5 minutes of pre-orders going live, then you might have already received it. 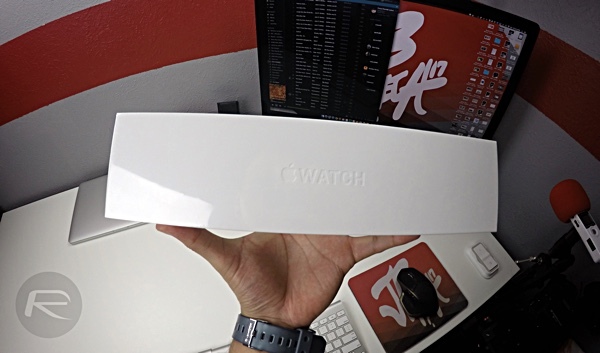 Those who are looking into purchasing the Apple Watch Sport, get ready for an enormous box! The Sport comes in a rather long package, which is going to differ from the Apple Watch steel edition and the gold Apple Watch Edition which come in smaller square boxes. In the packaging of the Sport edition, you get supplied with two bands; a small/medium band and a medium/large band. So for those who have big wrists, you are covered. 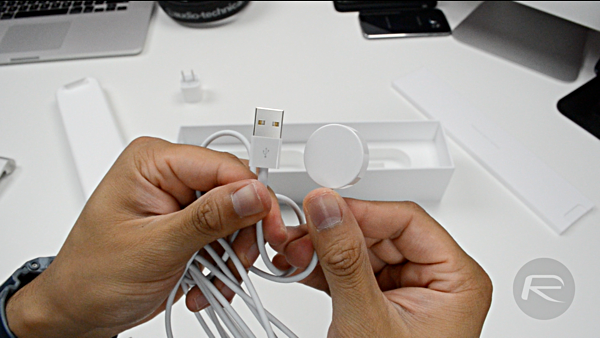 You also get a standard 5w wall charger and magnetic charging cable. The magnetic charging cable is going to be different in comparison to other Apple Watch models, which have a more metal construction to them. 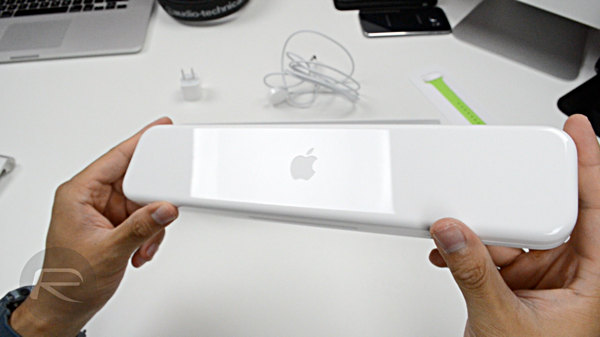 The Sport model comes with the plastic version of the magnetic charging cable. Setting up the Apple Watch was quite simple. You’ll first be prompted to select a language. 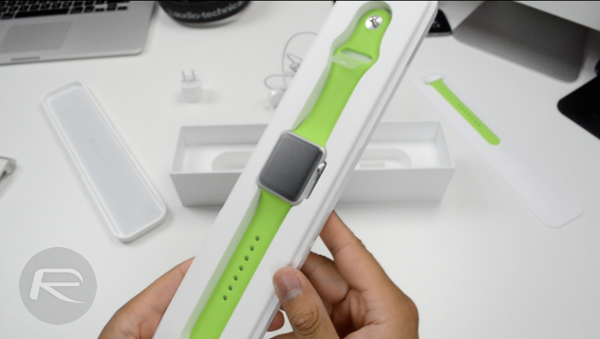 After that you will have an animated screen that will have you open the Apple Watch app on your iPhone to pair. This screen on the Apple Watch will help you simply pair to your iPhone by holding your smartwatch and align it to the camera, similar to how QR codes work. Once your iPhone’s camera reads the Apple Watch, you will continue with the setup process. When completed, you’ll be ready to start using your new Apple Watch. Apple’s smartwatch is available in two sizes for all models; 38mm and 42mm. I opted for the 38mm – because it was the only one I could get my hands-on at launch – and when placing it on my wrist, I will have to say it is quite small for my liking. Personally, I like to wear bigger sized watches like G-Shocks. 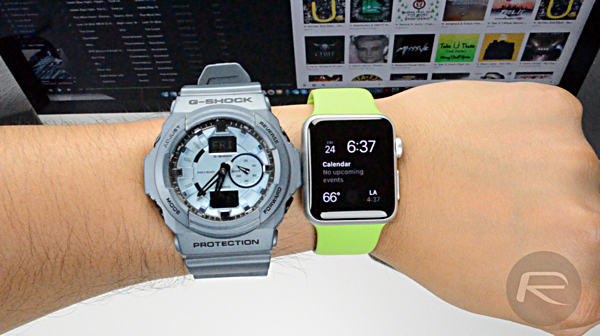 In comparison, you can tell the Apple Watch seems small. The 42mm would be an ideal size for my wrist. I won’t get mine until June, but I’m looking forward to it helping reduce the amount of times I pick up my iPhone to check messages and notifications. I got the space gray sport watch. That is a bummer you have to wait so long. You may get it sooner than expected though as many orders have been getting delivered weeks before the initial date people have received when ordering. It definitely helps reduce the amount of times I, personally, have picked up my iPhone just to check a notification. Also has helped preserve my battery life.